Red eyes, dry eyes, and allergies are common eye problems that affect millions of Americans each day. Even though these are common afflictions, diagnosing the underlying cause isn’t always as straightforward. It can be difficult to know whether you are dealing with infection, allergy, inflammation, or dryness, which is where First Eye Care comes in. Making regular visits to your eye doctor will go a long way in keeping your eyes healthy and free of infection or any other problems. While most people have experienced dry, red, or itchy eyes at one point during their lives, it may be cause for concern if you suffer from these conditions on a regular basis. At First Eye Care, we are dedicated to educating our patients about proper eye health and common conditions that may impact this. We understand that each individual is different and may experience various symptoms over the course of their life. We believe in establishing a relationship with our patients and helping them address any concerns before they turn into a problem. If you are suffering from red, dry, or itchy eyes, find the First Eye Care location closest to you and make an appointment with one of our experienced eye doctors. Why Are My Eyes Red and Irritated? Pink Eye - Most people (especially those with kids) know what pink eye is and probably have firsthand experience with the nasty eye infection. While it is commonly associated with kids, adults can get it too. If you notice red eyes along with itching, burning, stinging, eye discharge, swelling, and watering, you should see a doctor for pink eye. Eye Allergies - Allergies are often seasonal to fall and spring or they can occur when something irritating gets in your eyes. Everyone has different allergies and reactions, so be sure and discuss any concerns with your eye doctor. Broken Blood Vessel - Another common cause of red eyes are broken blood vessels. There are many tiny blood vessels in the white of the eye that can break from irritation, rubbing your eye, straining, or just out of the blue. When this happens, the eye becomes red and can be quite uncomfortable. Eye Trauma - When your eye sustains any type of trauma (such as getting hit with a foreign object) it can cause redness. Dry Eyes - Dry eye syndrome takes place when your tear glands cannot produce enough tears in order to ade quately lubricate and support your eyes. For many people, this is not only irritating and uncomfortable, but it can make the surface of the eyes inflamed and irritated, causing them to appear red. For some, dry eye syndrome is not curable but can be managed with prescription eye drops, punctal plugs, or lubricating drops. 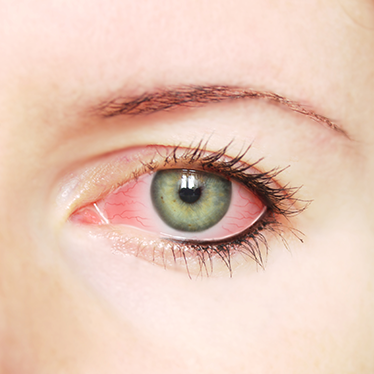 There are many different causes of red, dry, or itchy eyes, as you can see. If you are suffering from an uncomfortable eye condition, contact First Eye Care and schedule an appointment today.